A codicil amends a will. If a will represents the thoughts of the person drafting the document (the “testator”), then the codicil is the testator's change of mind. A codicil to a California will can change any part of the will, including who gets the testator's money or other property and who will be named as a guardian for the testator's children. In California, the testator must follow the same formalities in drafting a codicil that are required when drafting a will. A codicil to a will in California amends the will, so that when the time comes, the court must read both documents together to determine what the testator had in mind for his estate. Since the codicil is written and executed after the will has been signed, the codicil's instructions usually trump any contrary instructions in the will. You can't amend a will in California by crossing out and writing in words, or adding or tearing out pages. Under California law, the testator must adhere to the same rules in writing the codicil that he followed in drafting a will. For instance, the testator must be at least 18 years old, have sufficient mental capacity and must sign the codicil before at least two witnesses. People marry and divorce as time goes by, and in California, those so inclined may acquire and shed domestic partners. Babies are born, friends are made and lost, relatives die or fall out of favor with the testator. The guardian named for minor children may be unavailable or unwilling to undertake the task when the time comes; or children may have grown up and the testator has decided to disinherit them. 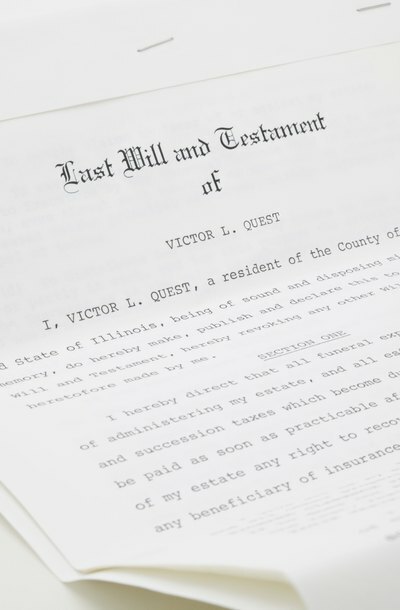 If life’s changes make parts of a will obsolete, the testator's assets covered by those directives could pass by intestacy – California's default rules for who is next in line for the testator's estate. If the testator has a different plan, he must put it in writing, in the will, and to change the plan, he may execute a codicil. If Scrooge McDuck wants to change his estate plan to leave his fortune to great-nephews Huey, Dewey and Louie but disinherit nephew Donald, he has to spell out the change. A more typical example of a codicil to a California will changes the beneficiary if the testator outlives the beneficiary he originally named in the will. Just as families change, so do estates and the property comprising the testator’s assets. What if the will executed in 1980 spells out who gets the Malibu beach house and Beverly Hills mansion but not the San Francisco condo the testator bought in 1981? A codicil can clarify the testator's wishes and avoid the tricky problem of “ademption” – a situation in which the testator sells or gives away property before he dies but is still listed in the will. A codicil noting the changes can save the estate an expensive legal cat fight by irate relatives wanting to know what happened to Grandma's ring and the Picasso over the fireplace. Codicils, in California as in other states, are a relic of the Bartleby and Scrivener days. When wills were handwritten and not created on a word processor, codicils made sense, since rewriting multiple pages by hand to make one small change led to unnecessary expense, copying errors and litigation. Another problem with codicils is that they can be confusing, especially if clause A of the will is changed but necessary updates to clauses B, C and D are overlooked. Thanks to the era of computers and word processors, it is now possible to simply void the original will and draft a new one without injecting confusion into the estate with a codicil. A valid will can nominate someone to manage your estate and detail how your property should be distributed when you die. In Illinois, wills must comply with the Illinois Compiled Statutes, which address requirements such as the age and mental condition of the person making the will. If your will doesn't meet these requirements, it may be declared invalid, and your estate will be distributed according to state law.